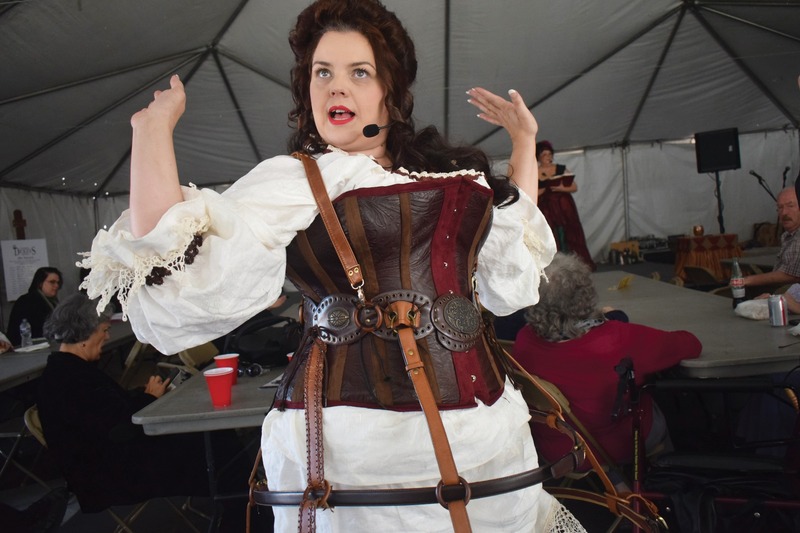 The 26th annual Dickens Festival was held in downtown Riverside Feb. 23–24 to honor the impact Charles Dickens had upon Victorian-era London. At the Dickens Festival, people get together to celebrate by dressing up in Victorian-era costumes and reliving the century. Actors were spotted dressed as historical figures ,such as Charles Dickens, Emily Dickinson, Edgar Allan Poe, Mark Twain, Jane Austen and Oscar Wilde. These actors interacted with regular Riverside residents as if they really were the people they were portraying, reading the greatest works of the historical figure they were re-enacting. Lillie Olger, a vendor, has worked at the Dickens Festival for many years. Ken Stansberg, an actor, portrayed Mark Twain and said he has been in the Dickens Festival for nine years. “This (happens) because people like literature and books. Real books. That era produced the greatest authors,” Stansberg said. Vendors sold items that would not be sold anywhere other than at events such as the Dickens Festival, including clothing, traditional foods and accessories from the Victorian era. These booths also included petting zoos with animals that were popular back in that era as well as traditional foods. Activities were divided into categories such as Tea Corner, Hyde Park Corner, The Grant Family Stage, The Tavern, Royal Victorian Theatre, Oliver’s Alley and Author’s Salon. In Tea Corner, the public could “meet” authors and inventors from the Victorian era, including Mark Twain, Mary Shelley and Thomas Edison. The Hyde Park Corner was for debates and recitations. Other special events included the Grand Parade and a fashion show. Although this festival was free to the public, certain extra events required special tickets. For a small fee, attendees could join in activities such as “Escape Mr. Creakle’s Boarding House,” which was a Victorian-themed escape room, or “Fezziwig’s Grand Victorian Ball,” which included activities like dancing and important displays. Caroline Thoennes, freshman music performance major, attended the Dickens Festival to learn and explore the Victorian era. “I was there because I thought it would be interesting to see actors dressed in Victorian-era costumes. Each one was unique, some through color-mixing, while others through fabric design,” Thoennes said. She said she also enjoyed the vendors because the workers were informed about the items they sold. “The buyers would ask about the items and the seller would give a little history on the importance or its purpose during the time period,” Thoennes said. Jessica Gregory, an actor at the Dickens Festival, said her role was to be a peasant animal keeper at the Moonlight Petting Zoo. “Dickens festival is definitely something unique, something you don’t see every day,” Gregory said. She said she usually participates in Renaissance festivals but this was her first year with the Dickens Festival. The Dickens Festival celebrates the life of an extraordinary writer from the Victorian era, Charles Dickens. Riverside hosts this event every year to emphasize the impact the Victorian era made in literature.